We are finally at the end of a long winter. Buds are peeking through the ground and I am so ready for spring! One of my favorite parts of spring is Mother’s Day. I love the cute little things my kids make for me at school, but mostly I love spoiling my mom. Even now that I am all grown up, my mom still does things for me every single day. 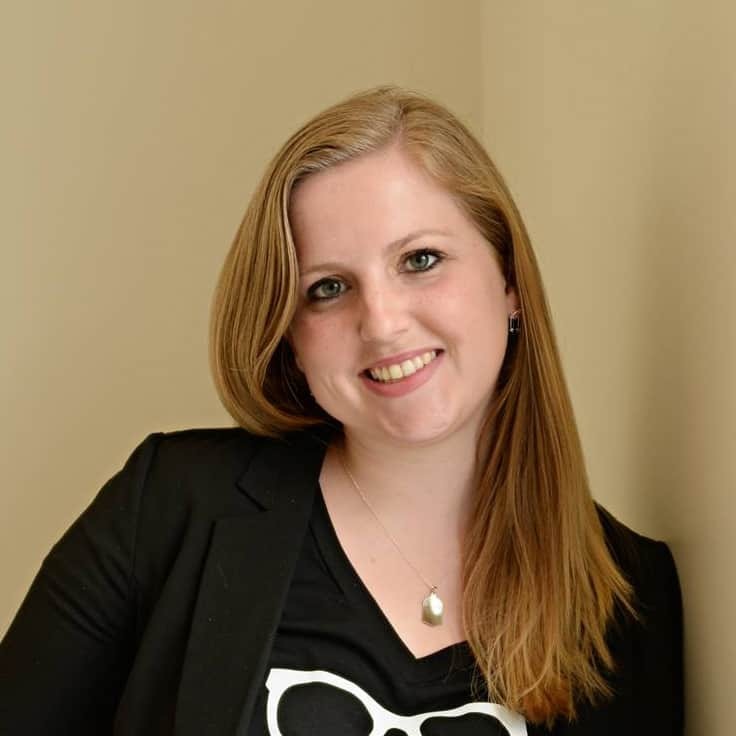 She has run carpool for me, picked up groceries, watched my kids and just in general been the best mom I could have hoped for. This Mother’s Day, I am pulling together an entire basket of sunshine for my mom to help her know what a light she has been both in my life and my kids’ lives. 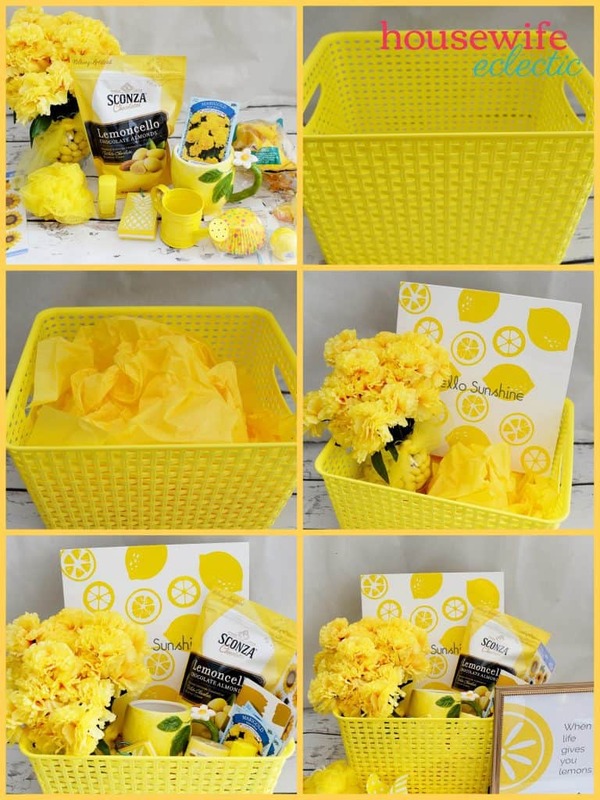 A basket of sunshine is the perfect gift for mother’s day or just for someone who is feeling a little down. 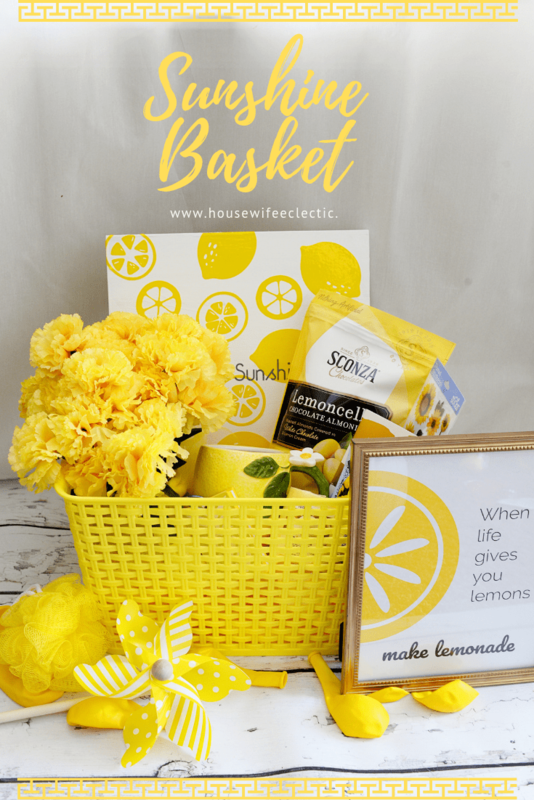 Who wouldn’t want an entire basket full of lemon and yellow goodness? I love putting these baskets together whenever I know someone needs a pick me up. 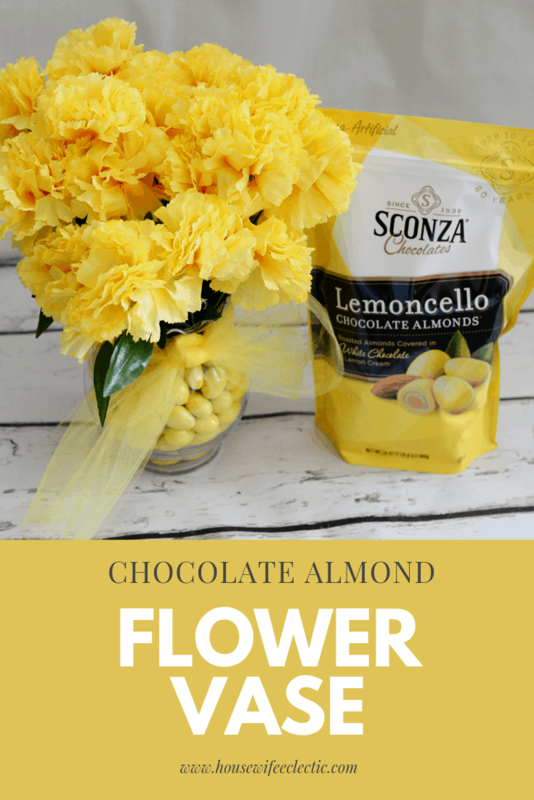 Every happy basket needs a little chocolate and these Sconza Lemoncello Almonds roasted almonds are covered in white chocolate and lemon cream, for the perfect combination of chocolate and citrus. They are quite literally one of my all-time favorite treats, so I always make sure to include them in my yellow sunshine baskets. I love Sconza for more than just their delicious almonds. They are a family owned and operated business built by hardworking people. Sconza Chocolates is proof of the American dream and they are celebrating their 80th anniversary this year! I usually grab my almonds at Costco when they have them (they will be there in April and May), but when they don’t, I order online at Sconza.com. Use the code eclectic10 on Sconza.com to get 10% off! This Chocolate Almond Flower Vase is so easy to put together and it really is a bright spot of sunshine! Wash and dry your glass vase. Using a glass vase with a lip will help the tulle stay put. 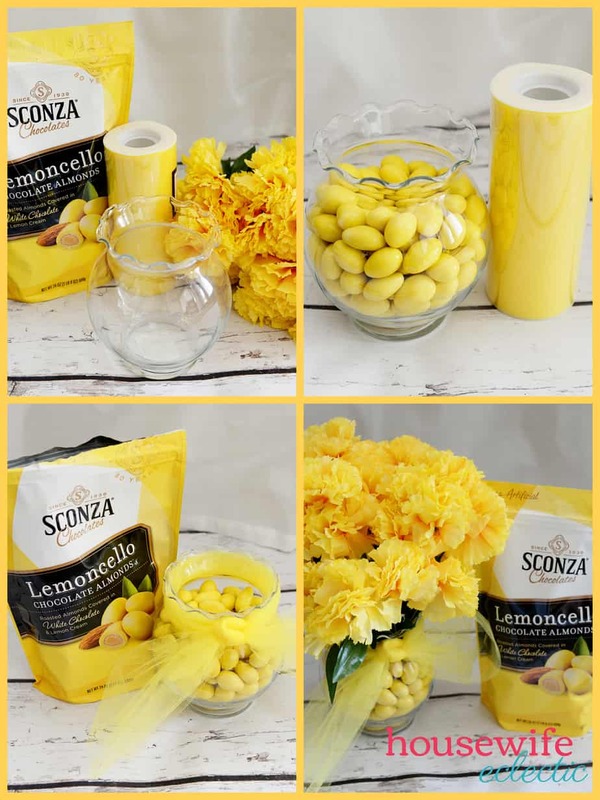 Fill your vase with Sconza Lemoncello Almonds. Tie a bow with yellow tulle around the lip of the vase. If you are using a shorter vase, you can bend the stems of your fake flowers before you put them in the vase, to make them the right height for the vase. Fluff your flowers and try not to eat all of the almonds at once! 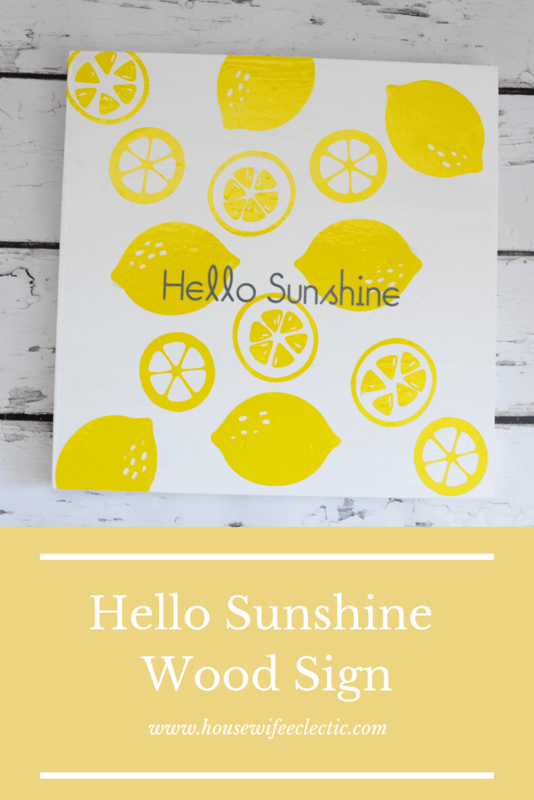 This Hello Sunshine sign is actually my favorite thing I have made lately! I love the bright colors and it was actually pretty easy to pull together. Paint your wood sign white and then allow to dry completely. 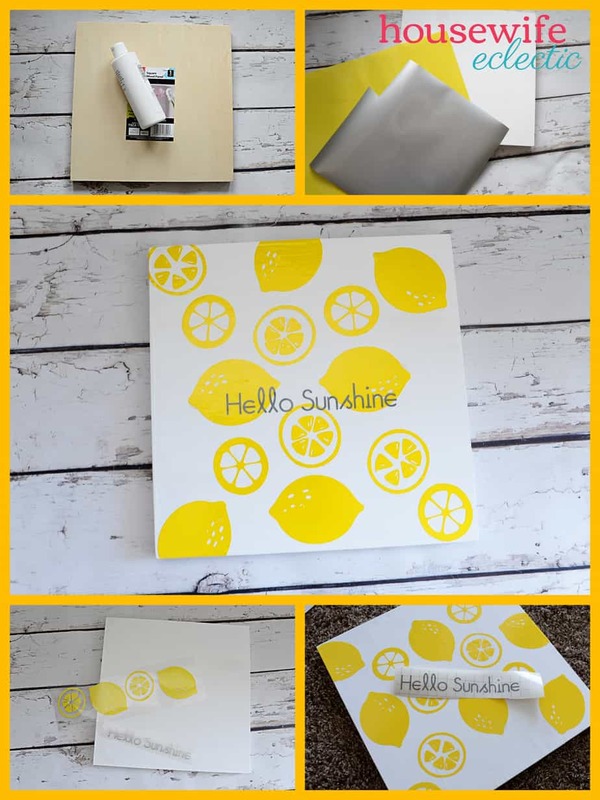 I used a darling lemon and lemon slice found in the Cricut library of images (Lemon #M719E9E0), but you could also find one online that you like. Usually, I search for line drawings to help narrow down the images. To make things really easy, you can use my cut files found here. Resize your lemons until your full lemon is just over three inches wide and the lemon slice is just over two inches wide. Add your words, Hello Sunshine (I used the font Anytime), and resize it to be 6.5 inches wide. Set your machine to vinyl and cut out all of the pieces. I used all of the pieces from this including the inside of the lemon slice. 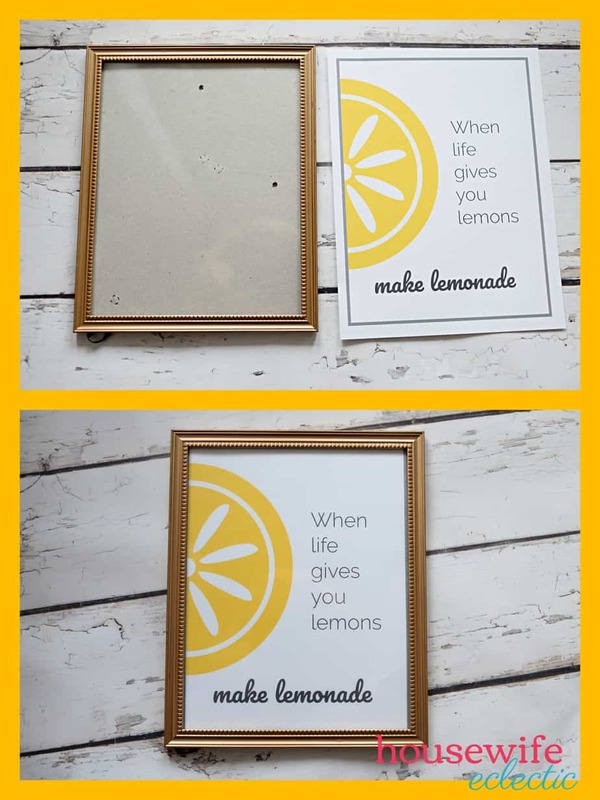 Place your lemons all over your wood using transfer tape. Weed out the excess vinyl, cover your design with the tape, peel the design off with the tape. Place the tape/design where you want it on the board and then use a flat edge like a credit card to smooth the design into place. Then peel the tape off! Not crafty at all, but still want to add some homemade touches to your basket? No worries, we got you covered too. 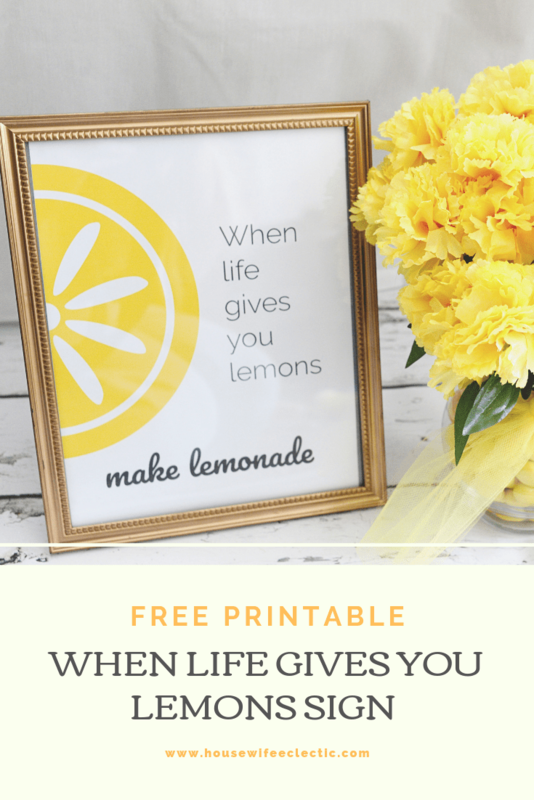 Simply download this darling lemon printable from the link below, add to a frame and put it in your basket! Printables in this post are for personal use and available to subscribers of Housewife Eclectic. To use this printable, please SUBSCRIBE NOW. How do you brighten someone’s day?